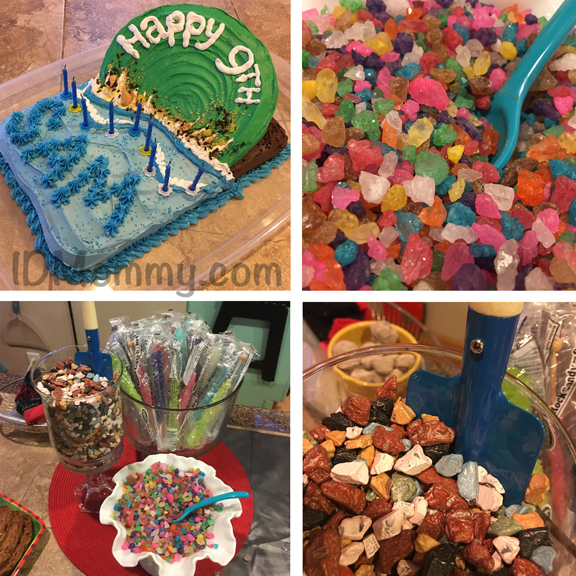 Rock / Geology Themed Birthday Party! Last December we had a party for Sam's 9th birthday, and being the rock hound he is, he of course wanted a ROCK theme!! Despite the lack of rock themed party supplies available on the market, I definitely had fun with this one!! 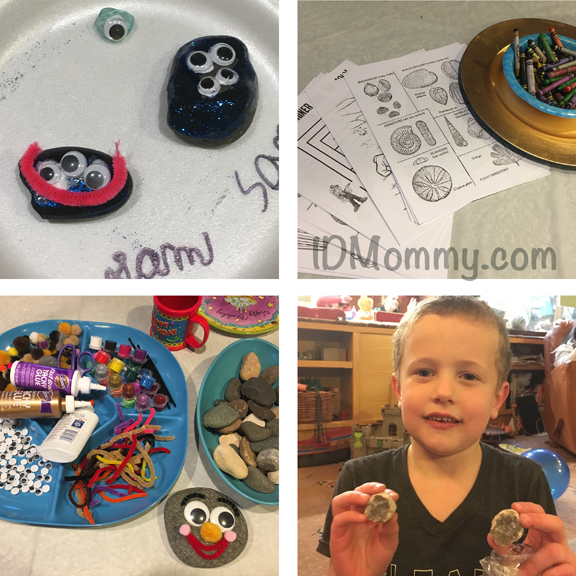 Pet rocks, coloring sheets, and break-your-own geode! Some of the many rocks made that night! 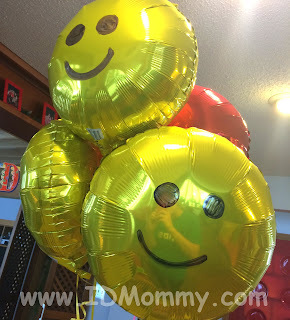 I did get a front loader balloon, but they just don't have "rock" balloons out there! Being from Minnesota, the pinata is a Lake Superior agate of course! That was a simple one to make...just your classic paper mache over a balloon. I punched it in a few places to make indentations while it was still a little wet, then added more layers to make it dry that way, and painted. 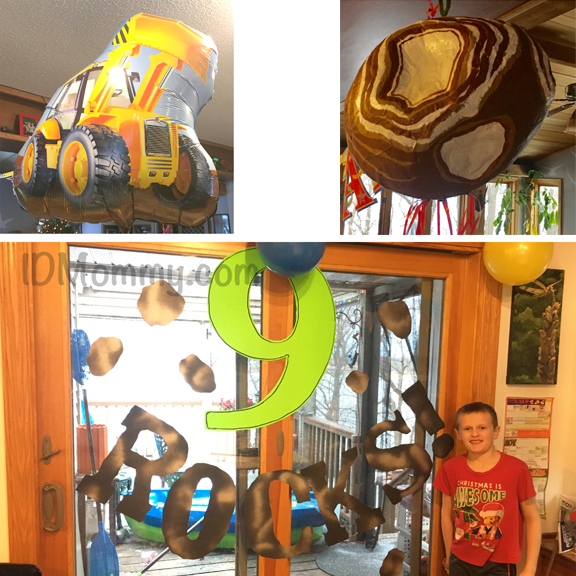 I made the big "9 Rocks" sign and little rocks with a sheet of fluorescent poster board and some black poster board from the dollar store. For the "Rocks" I just sprayed some random spots with silver spray paint to get a rocky texture, and then cut out the letters. All the scrap paper I just made rock shapes, and then taped them all around the house! For the cake I made a gold pan dipped in the water. This was a fun one...I had some shiny gold sprinkles, and also used some yellow rock candy for gold. For special treats I found some rock candy on Amazon, some loose crystal rock candies, and some chocolate rock candies. I got a set of sand shovels to use as scoopers. 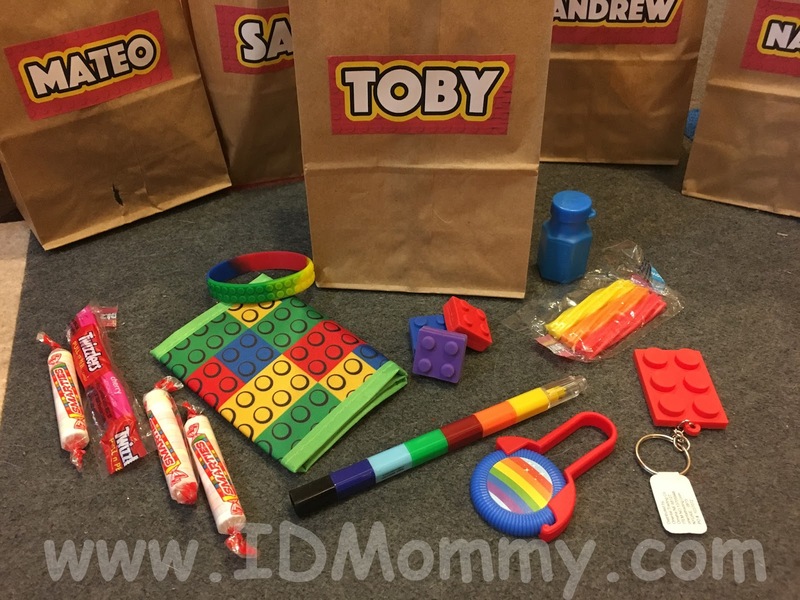 I can't seem to find a pic of the goodie bags. 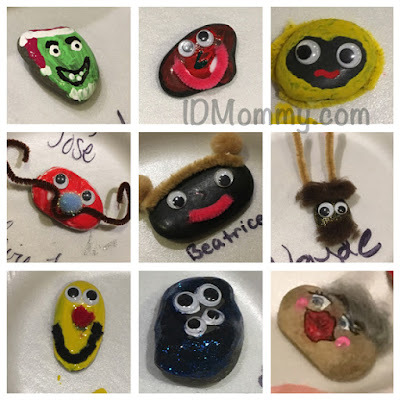 But, each bag had a geode to break, a few cool arrowheads, some fools gold, a rubber ball that looked like a rock, Pop Rocks, and a rock candy on a stick! It was a really fun time, and a great theme...we have a lot of rock lovers in our family!! IDMommy Project: Cardboard Robot Fun! 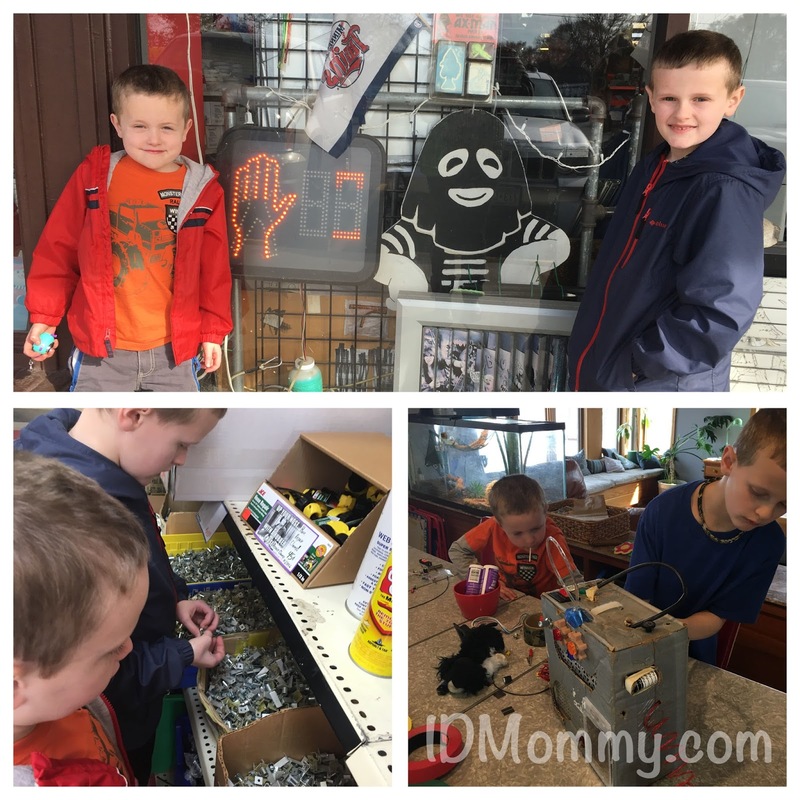 Toby & Sam with their cardboard robots! Here's a SUPER easy and cheap activity to keep your kiddos entertained this summer on rainy days!! 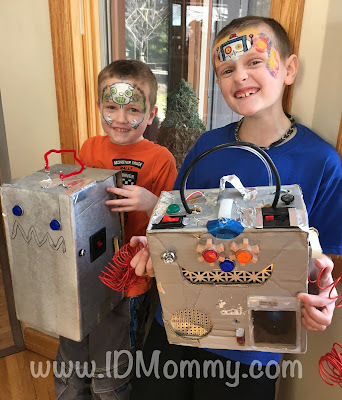 When I was little my siblings and I used to make "robots" out of cardboard boxes. I kept mine probably until I was in college...it was only maybe 10" tall and all decked out with a real antenna from a broken radio, and a red plastic calculator screen for the mouth. His name was Radar and I also installed a retractable tape measure that could pull out from his side! My sister and I even made a larger model named Rodney, that we could fit inside the back of to make his arms move! 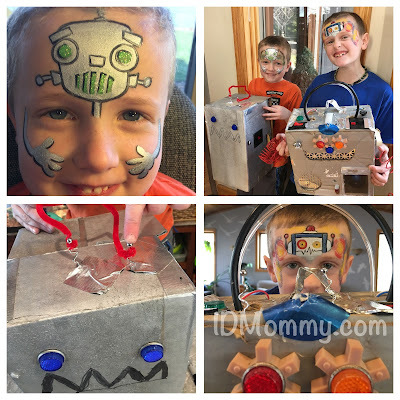 Years ago when Sam was maybe 3 or 4, I thought it would be fun to help him make a cardboard robot of his own. 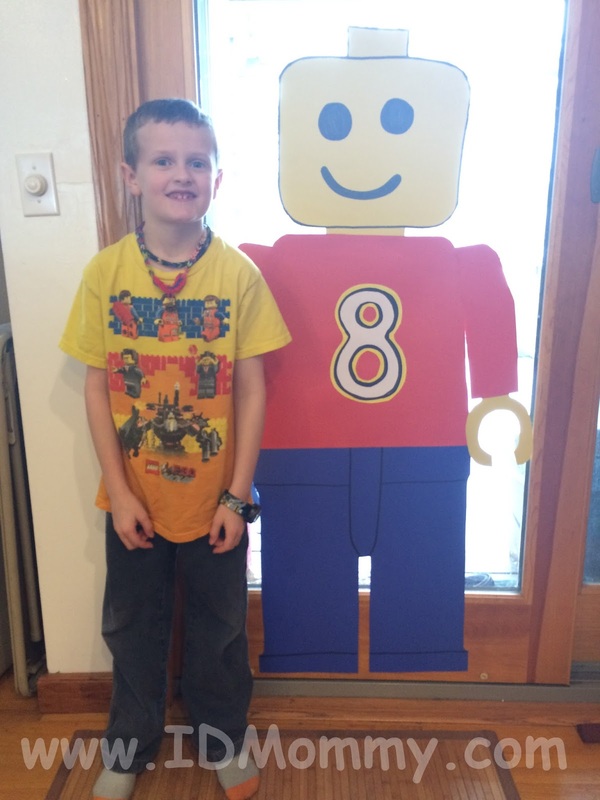 He was into Curious George at the time and loved the "Yorbo" episode, so he decided to name his Yorbo. I spray painted a cardboard box with silver paint, and the rest was up to him! (though I helped wield the X-acto knife when he needed a precise hole cut) We took a trip to AxMan, our local surplus store, and loaded up on cool random parts. Now Sam is 8 and this year I thought we'd help his little brother Toby make one too. Sam still has Yorbo and keeps adding more features to him! 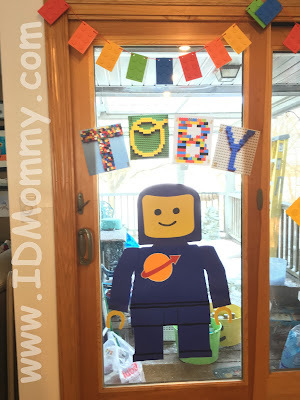 Toby now has two robots. 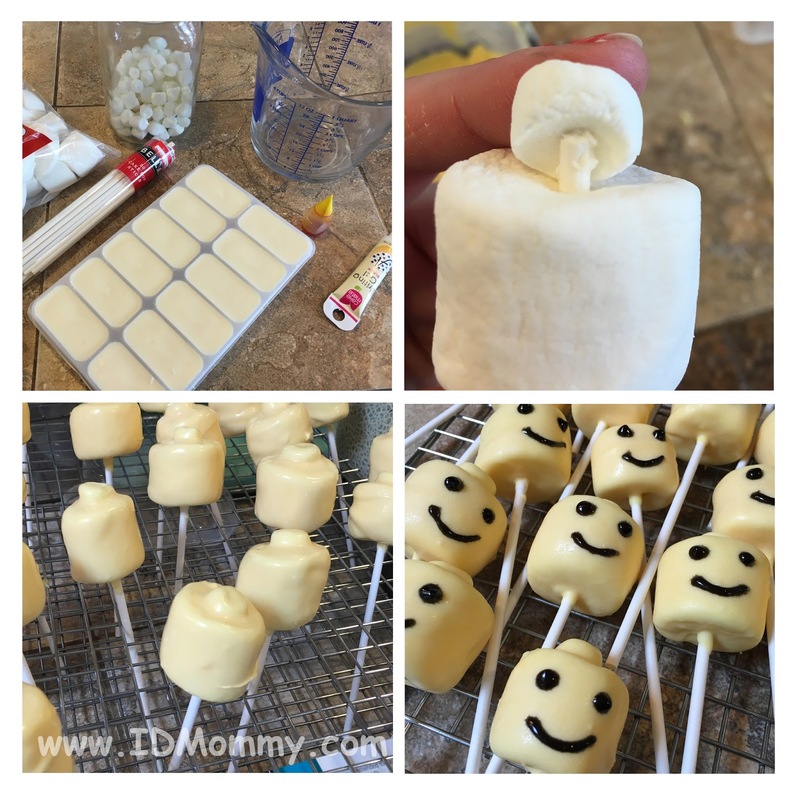 This is such a fun and simple project for kids, and one that you can be as involved or not involved in as you want. 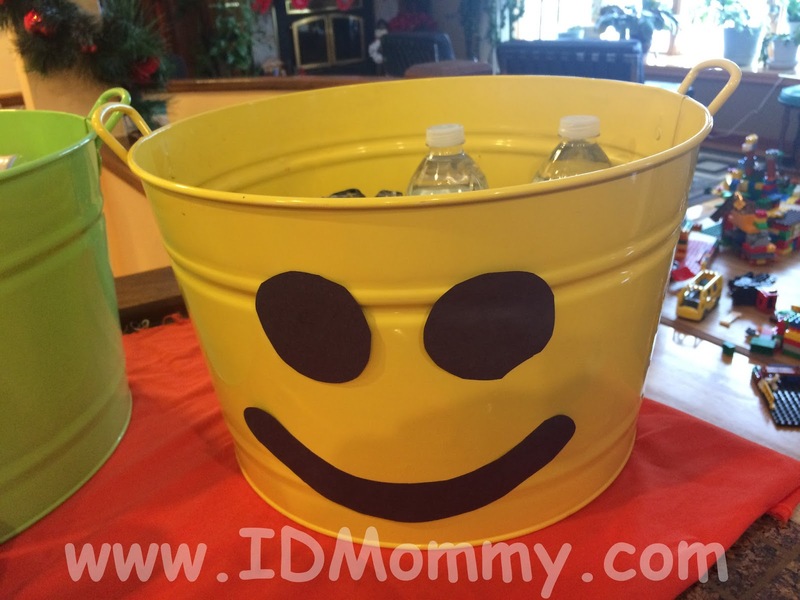 You can spray paint a box and let them go wild, or help coming up with ideas! Once Grandpa found out about their robots, he started saving cool parts from his workshop for them to add as well! This project can be as cheap or expensive as you want it to be. 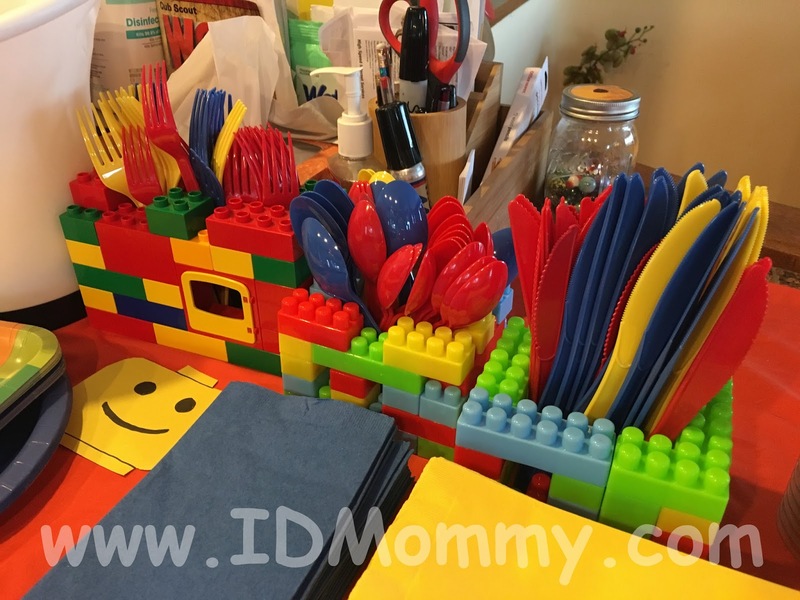 All you really need is a cardboard box, glue, tape, scissors, and random stuff from the junk drawer. A can of silver spray paint really makes them look cool to start with, but isn't required of course. A trip to the surplus store can add up fast, but they have so much fun with this part, even if I limit their spending. We got some cool metallic silver duct tape there which got completely used up very fast! They also got some fun buttons, switches and wires. Garage sale FREE boxes are a treasure trove for robot builders!! Last week my boys found 6 remote controls in a free box and were SO excited. They now have cool rubber buttons and little circuit boards. I had to do some robot face paintings too! Rent or borrow a copy of the movie "Robots" to get your kids inspired! I was able to snag a brand new, unopened DVD of Robots at a garage sale for $0.50 and the boys love it. 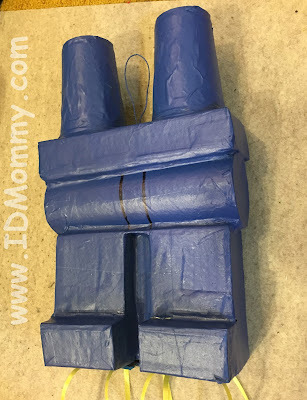 Or, show them this post and just start taking apart a broken toy or electronic! Once they get into it the possibilities are endless! Boys all painted for school! Toby had complained of something in his eye that morning and I encouraged him to try to make tears to wash it out. But, later that day I got a call from the school that he wasn't doing well with his eye and rubbing it a lot. So, I had to go pick him up and run him to the doc. They saw some scratching on his eye and gave us drops, which did end up clearing it all up by the next morning. 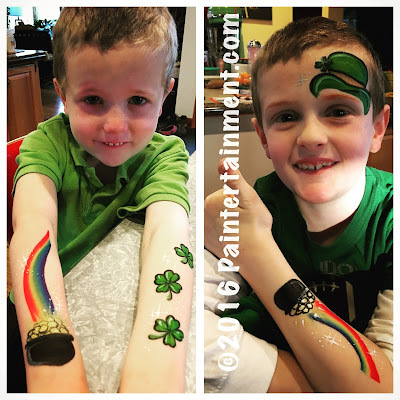 But, he was SO bummed to miss out on all the St Patrick's day fun at school!! 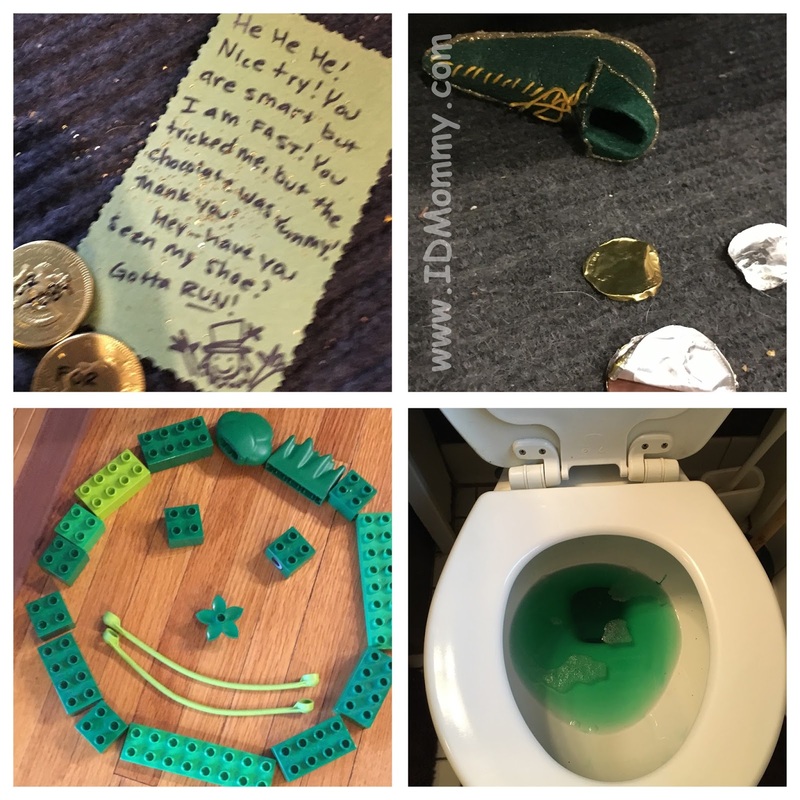 They always have a mischievous leprechaun visit their classrooms and wreak havoc. 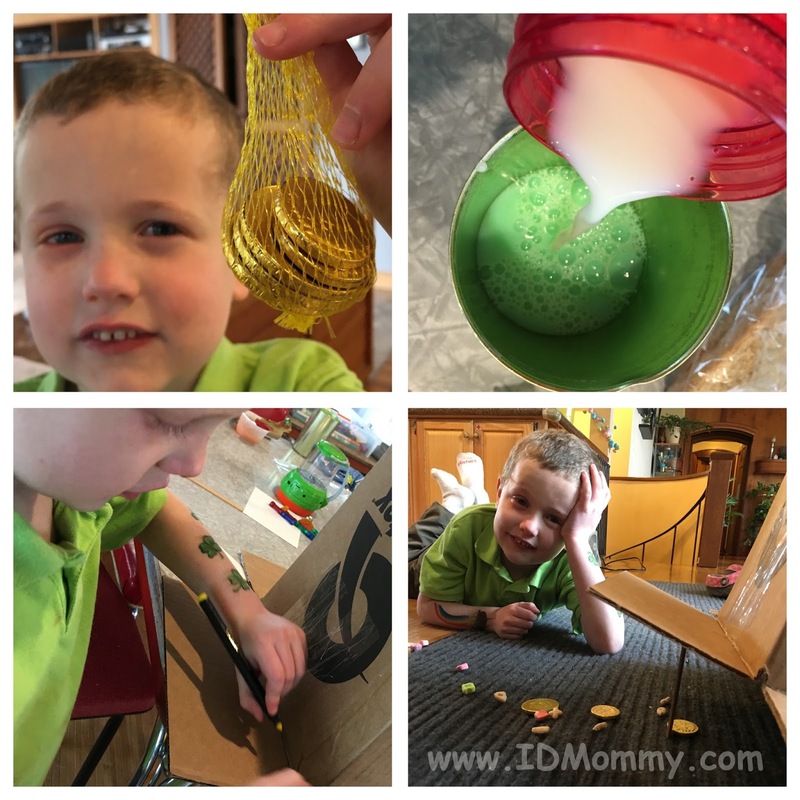 His class had planned to make leprechaun traps that day. 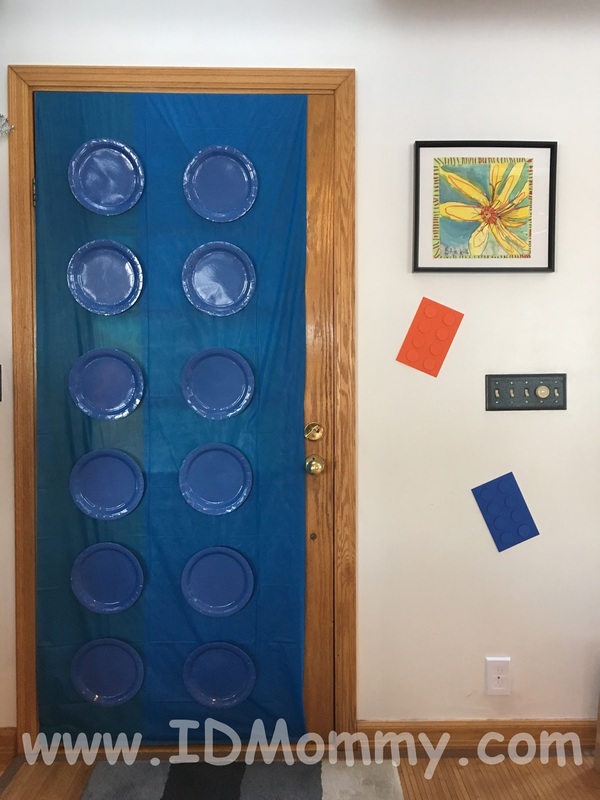 So, in an effort to still make it a fun day, we stopped at Walgreens on the way home to pick up some chocolate coins as "bait," and made our own trap! Building our trap! And the mysterious milk that turned green at lunch! Whaddaya know, turns out the leprechaun did end up visiting our house during his nap, leaving evidence all over! 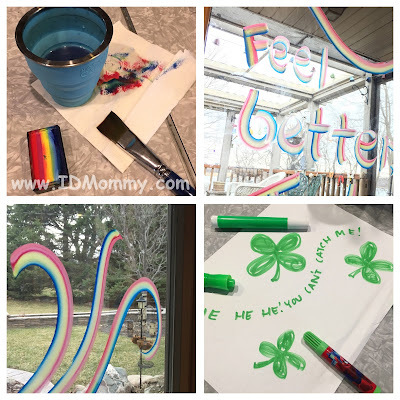 Darn, I knew I shouldn't have left my face paints out on the table...I guess I should have known that a leprechaun couldn't resist a rainbow cake, as he painted all over the windows!! Unfortunately we didn't catch the little bugger, but we did manage to catch his shoe in the trap!! Toby was pretty excited to bring the shoe back to school the next day to show his friends! I don't normally plan anything for this holiday, except for wearing green. But, Toby being stuck at home from school ended up turning it into a fun day! I already had plans to attend a balloon "jam" (get-together for balloon twisters) that night with my oldest, Sam...so we had a lot of fun that night while Toby got a fun night with Dad! 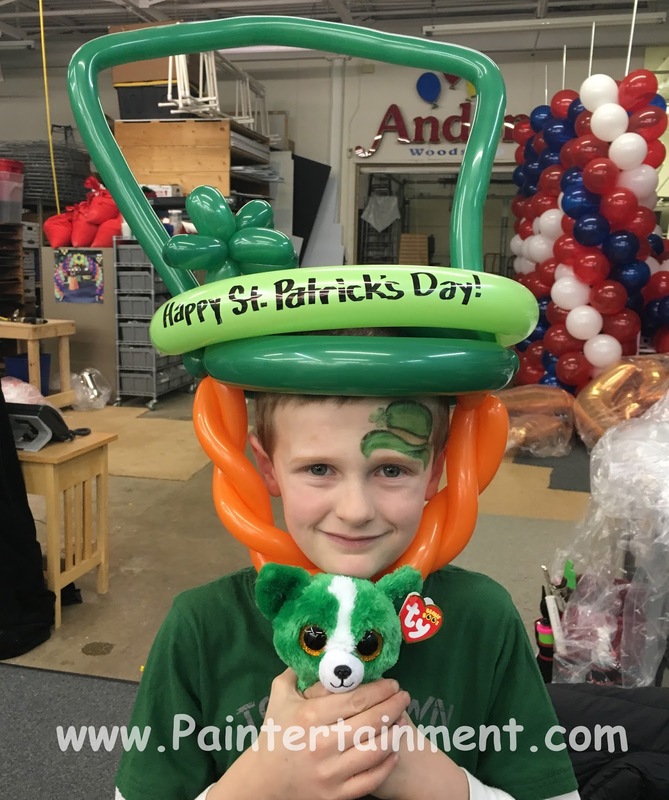 I made a balloon hat for Sam! This year, even though it involved a trip to the pediatrician and pharmacy, and I didn't get ANY work done, it turned out be a great day of one-on-one time with each of my boys!! Hope you had some fun on St Patrick's day! 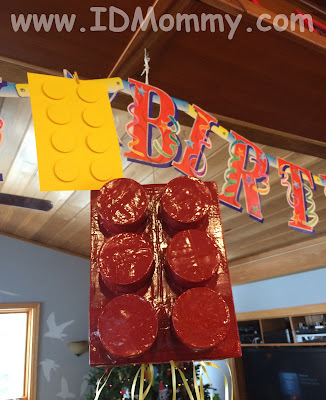 Well, I'm WAY behind on my blogging, but I thought I'd start catching up by sharing the not one, but TWO Lego themed birthday parties we had in our house, just 1 month apart! When I heard that both of my boys wanted Lego parties, part of me thought, "great! I can re-use stuff!" But then the other part still wanted to make each party unique and special in their own way. So, I did do a mix of recycled decor and new stuff. 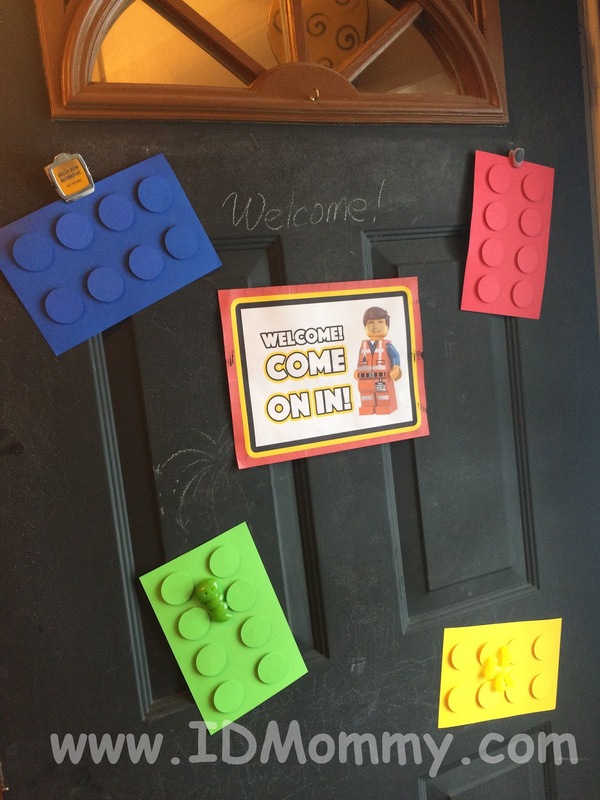 So, if you're looking for Lego ideas, you're definitely in the right place...here are TWO parties' worth of ideas!! 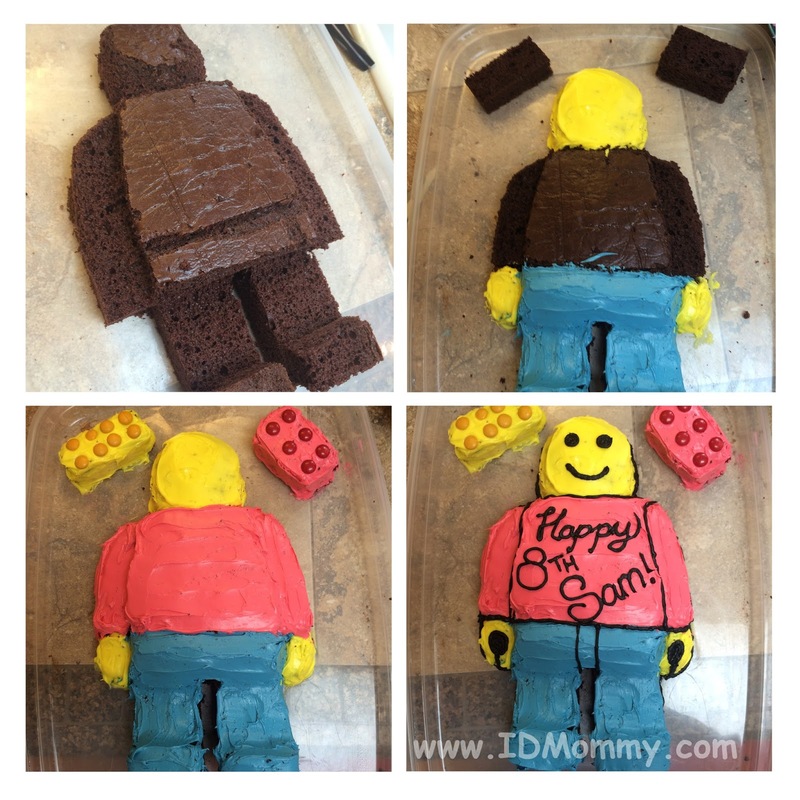 Sam's cake I sortof carved out of a sheet cake! I used some extra trimmings to make a couple loose Lego blocks, with matching M&M's on top! For Toby's cake I decided to make a big Lego head! I just made two bundt cakes, and then realized it wasn't quite tall enough when I stacked them. Luckily I had an extra sheet cake in the freezer, left over from Sam's birthday the month before (I though I'd need two but didn't). 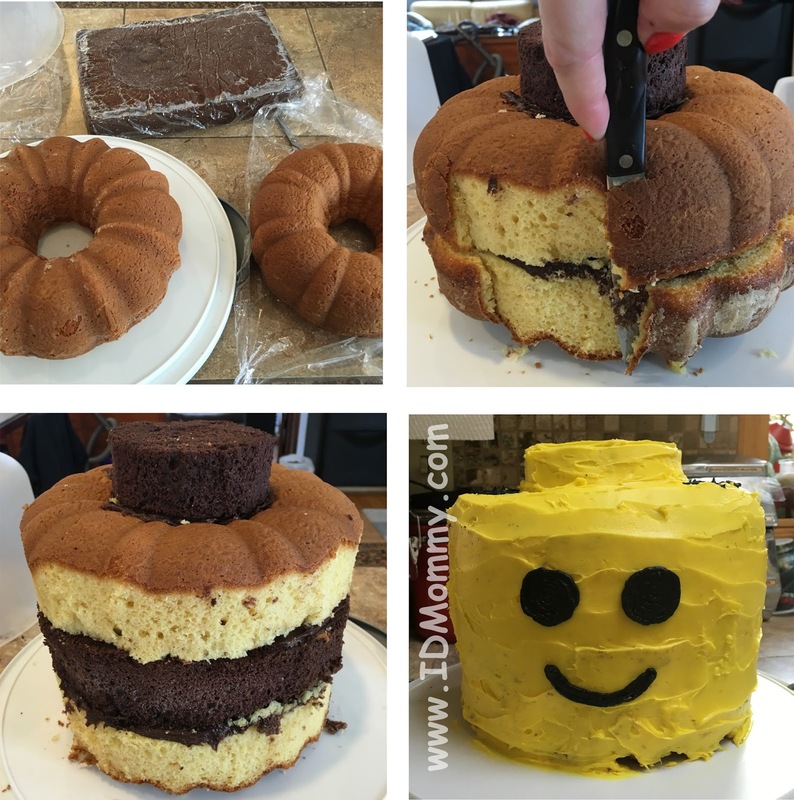 So, I put a layer of that cake in the middle to give it more height. Then I filled in the top hole and put a round piece on top to get that interlocking shape! 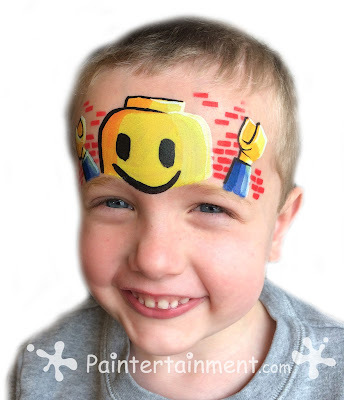 Our local dollar store didn't have anything Lego related, so I just got some primary colored, blank mylar balloons, and drew faces on the yellow ones! There really is no need to buy licensed character plates and napkins...just get colors that go with the theme and it all goes great! 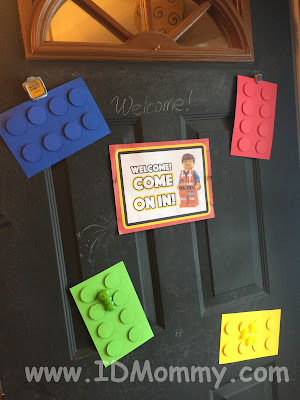 The Lego doors were super fun and cheap to do!!! I did a blue one for one kid and a red one for the other. This is just a plastic tablecloth and matching paper plates from the dollar store. The whole thing cost maybe $3 bucks! 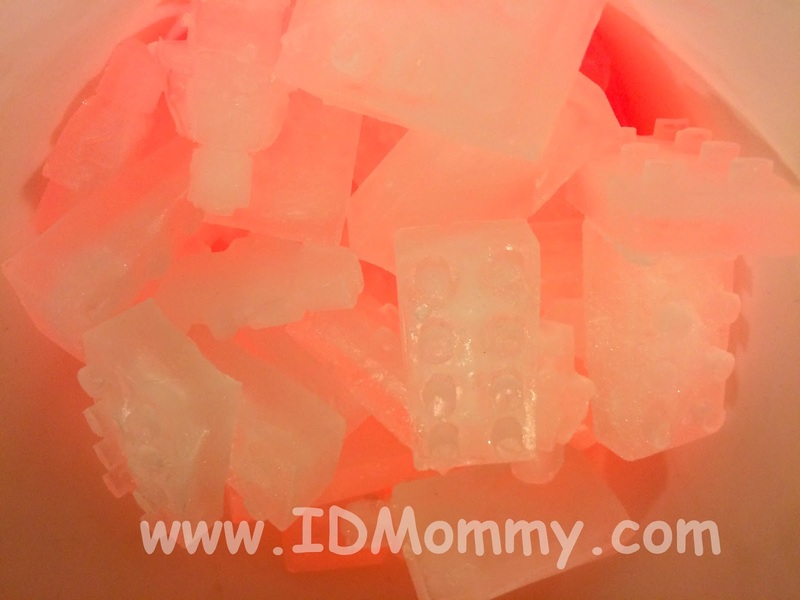 The interlocking Lego candies I got on Amazin, and got enough to have plenty out for both parties. I found this cute idea somewhere online to make Lego head marshmallow pops! They turned out so cute!! Toby LOVES skittles too so we had a bowl of those for him! Toby really loves the line from the movie, "Honey, where are my pants?" So, I just had to make a pants shaped pinata for him!! The top parts are just plastic cups glued to the box! The rest is just made up of cut boxes and tubes. Then the whole thing is covered with paper mache and painted. I usually just use paper lunch bags, and then print out the kids' names on the computer to label them. For Sam's party the kids got bubbles, pencils, minifigure-shaped crayons, Lego candies, and these suuuper cool notebooks. The notebooks were also from Target's dollar section, $3 each! Later they sold mini ones for $1 but it was too late for us! These were really neat though and went over well. 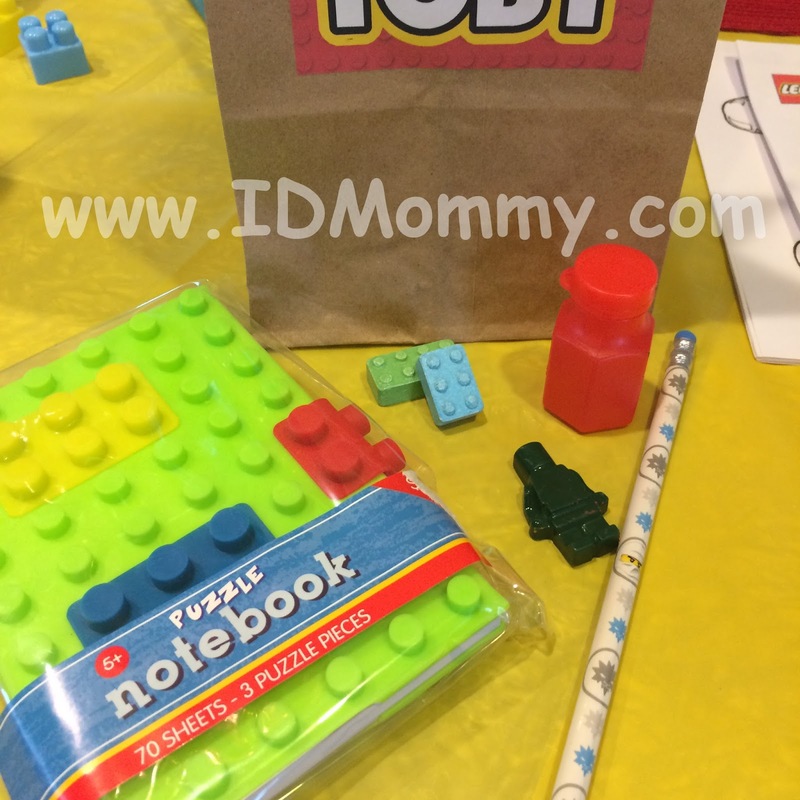 Somehow I ended up with more items in Toby's goodie bags, but there were so many fun things it was hard to choose, ha ha! I got some cool Lego wristbands for Sam's party, as he's a huge wristband collector, but there were only 12 in the pack and he had more kids than that attend. So, we saved them for Toby's. 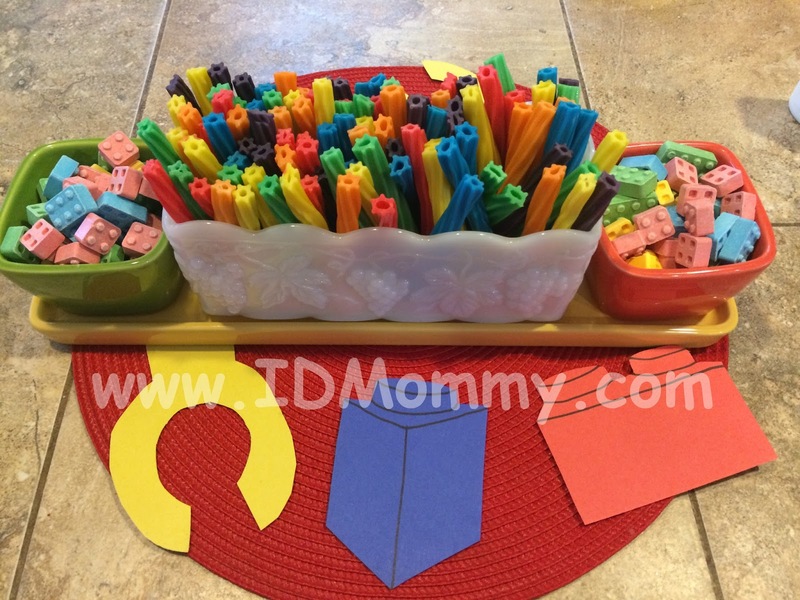 The cool stacking crayon/pen things and the round shooters I got at Goodwill! (Brand new donations from Target) Then I got some fun wallets and keychains (from Oriental Trading), and erasers. Yeah, I think I went a little overboard on the goodie bags this year...but they were SO FUN! 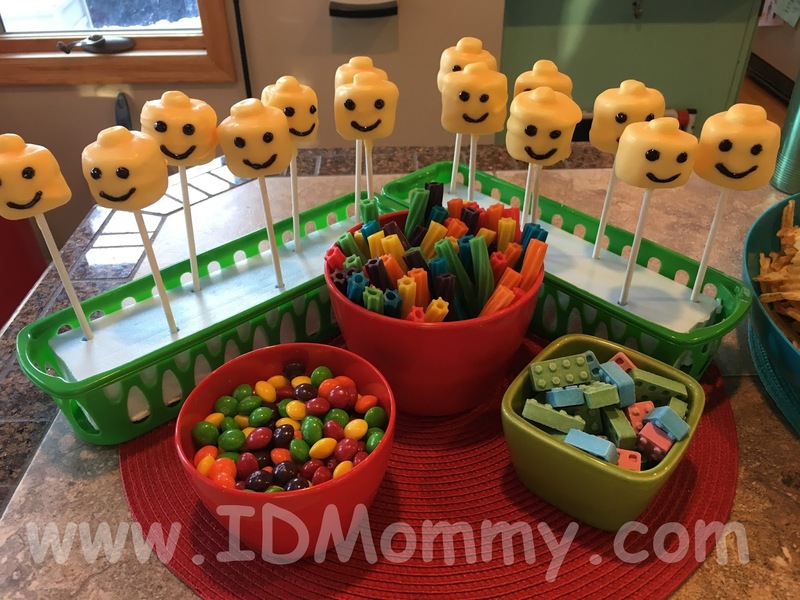 We had so much fun doing these parties!! I have been hoping for years that the boys would want a Lego theme someday, so you can probably tell I was excited to go overboard, ha ha! I hope this helps give you some ideas for your own kids' parties!! Thanks for stopping by and feel free to leave any of your own ideas in the comments! 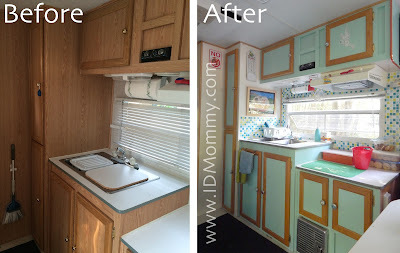 IDMommy Projects: Our Camper "Remodel!" I'd be willing to argue that 2015 was our best summer ever. A big part of that is due to us getting a camper part way through the summer. We've been tent camping together since we got married almost 16 years ago, but lately I had been looking forward to (not) sleeping on the ground and hiking to the restroom less and less. I guess I'm getting old. I have been looking at pop-up trailers for years, but my husband discovered and sold me on a hybrid camper. With a hybrid we get the benefits of both a hard-sided and a pop-out camper. It's small enough to haul with our Jeep, but plenty of space inside and we can use it with or without the beds popped out. There is a full bathroom with a shower, and we are now spoiled with heat and air conditioning when we really need it. And a mattress. OFF the ground. 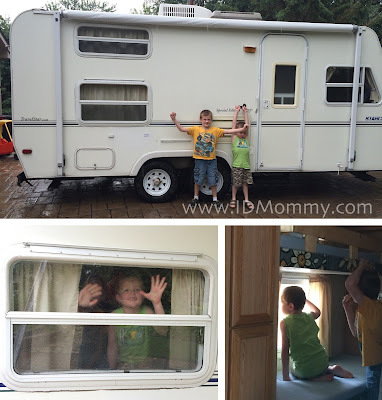 We found this camper via Craigslist and it fits our family perfectly. It's a Starcraft hybrid camper, with a queen and double bed that pop out. There are a bunk beds inside as well. One of our boys really wanted the top bunk bed, and the other wanted the pop-out, which was perfect. No fighting! The lower bunk we use to hold our bags and stuff, while we sleep in the larger queen bed. 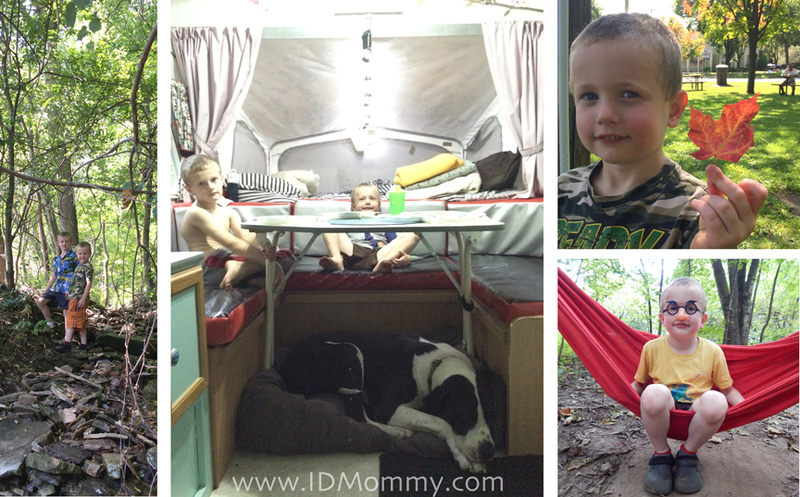 I am now just as excited as the boys for the next camping trip! 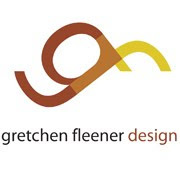 Of course, being a designer, I just couldn't resist replacing all the boring mauve, baby blue, and fake wood veneer with some retro fun!! Here are some photos of the transformation that our camper saw throughout the summer! Kitchen area...I painted all the fake wood, and left the real wood trim. There are a lot of blog posts and pinterest pics out there about "glamping," with all sorts of glamorous photos of campers that look like they are right out of an interior design magazine spread. 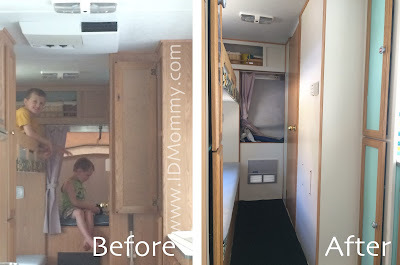 Keep in mind that while I did try to take photos of our camper while it looked it's best, even "glamping" isn't glamorous all the time! Most of these photos were taken in our driveway while I was working on things. Once this bad boy gets out into the wilderness, it is more often seen littered with pretty leaves, great walking sticks, cool rocks, and little containers of bugs, butterflies and caterpillars...just the way a camper should be!! While I always am working to keep our little space in order, it's not all perfectly neat while in use. 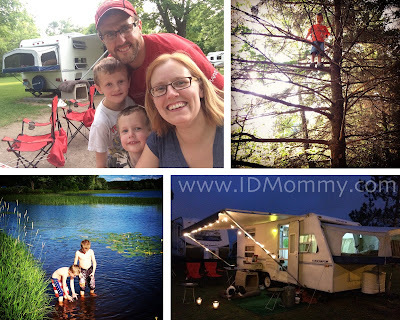 After all, I'd much rather be focused on making camping memories than keeping the camper pristine! I re-upholstered all of the cushions in silver, black, and sparkle red vinyl!! 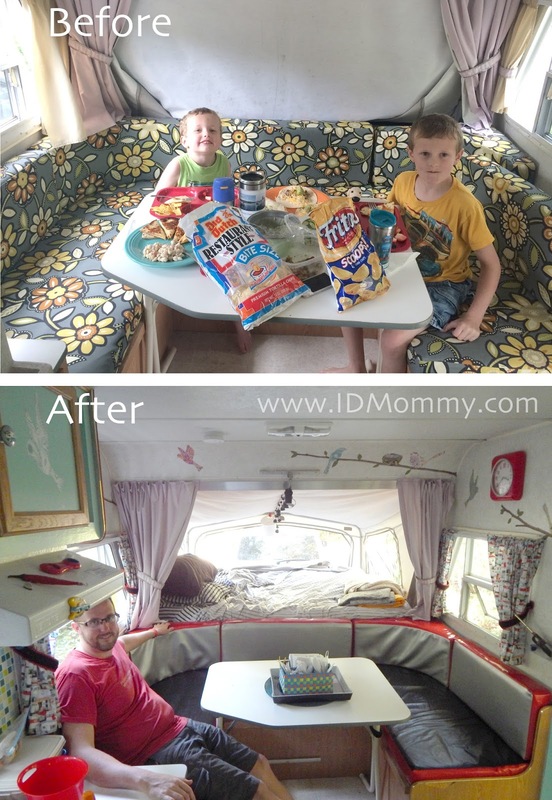 The camper had just been reupholstered with the flower canvas, which really was pretty cute. But, this really fit better with the overall theme and brightened up the area. I also had cleanability in mind here, and wanted dinette cushions that my boys could spill on and I could simply wipe up! 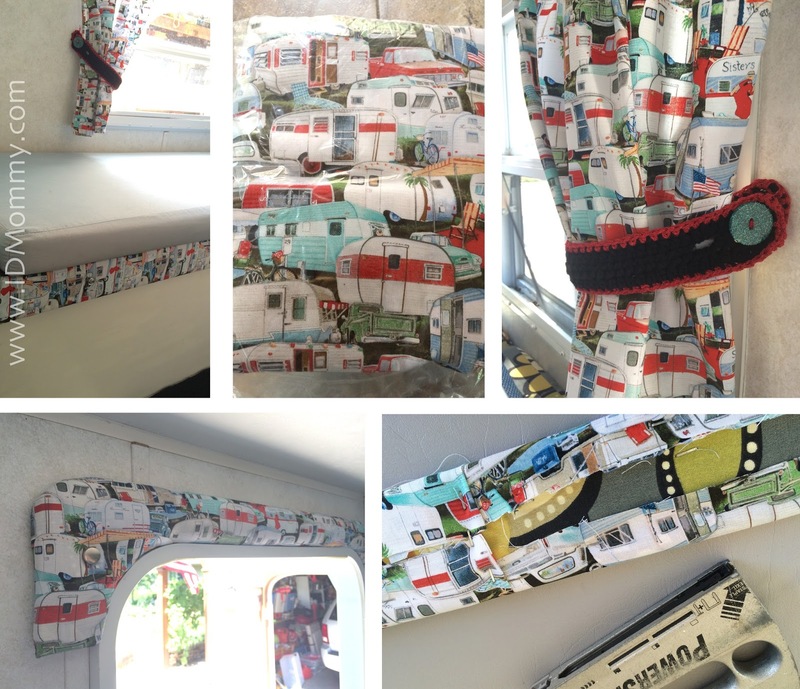 Curtains and other upholstery! 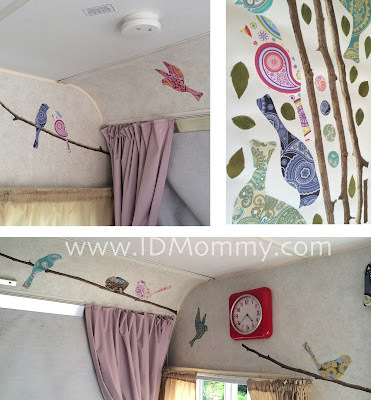 I found this adorable camper fabric on fabric.com and replaced all the pink curtains! The tie-back's I crocheted with black and sparkly red yarn, and then bought sparkly mint green buttons from the fabric store. All I did was yank the old ones out of the wall, and staple in the new ones with a staple gun! I used more of the curtain fabric to reupholster the padded boards on the bunk beds and above the doorway as well. 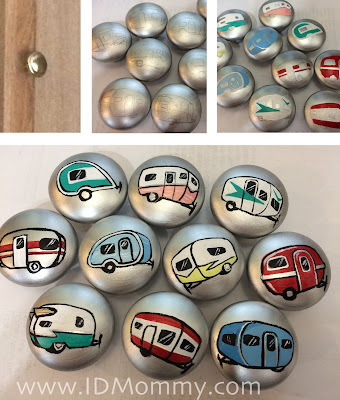 Really easy to do with a staple gun! The frig is covered with some fun plaid adhesive-backed vinyl! 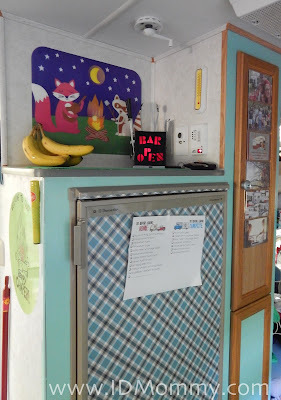 The cabinet door to the right of the frig has some clear plastic frames where I can hang photos of camping memories. Cabinet knobs! I shopped around for a while but knobs are expensive. So, I decided to spray paint the boring bronze ones, then painted little trailers on them with acrylic paint and gave them a couple coats of clear coat! I got these fun paisley bird and branch vinyl graphics on Amazon and scattered them around the dinette area. This peel & stick tile from "Tic-Tac-Tile" is awesome! You can cut it with scissors and just stick it on! 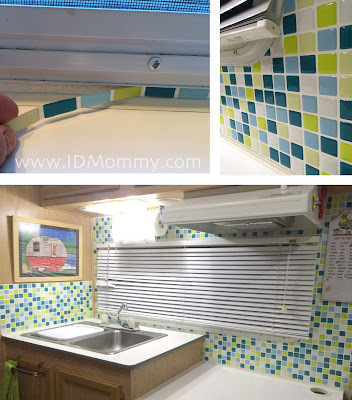 It made a really cool backsplash without adding tons of weight to the camper. I knew we'd have fun with a camper. I have fond memories of camping in our little pop-up as a kid, and knew I wanted my boys to create memories like that as well. But, even I didn't realize just how much fun we ALL would have, and how much MORE I would look forward to camping now! I love that I don't have to spend 2 weeks hauling stuff out of the shed, washing everything, and taking inventory every time we camp. It's so nice to have most of our gear all situated in the camper, and be able to just pack our clothes and go! We also save SO much money now on dog kennels, as we can take our dog Lucy along with us. She does GREAT in the camper and loves it! She is a 115 pound great dane mix and her and her bed fit perfectly under the dinette table overnight. It couldn't be a better fit for all of us, and we're looking forward to years of memories to come! The start of our family's camping memories! We've just scheduled what will likely be our last camping trip of the season, and then plan to make some repairs and improvements before the snow starts flying. I'm already looking forward to next spring! I've always had a soft spot in my heart for Chicago. I got engaged at the top of the Sears Tower (now Willis Tower) back in 1998. Chicago was the half way point of the many drives my hubby and I took on our trips back home to MN when we were living in Ohio. 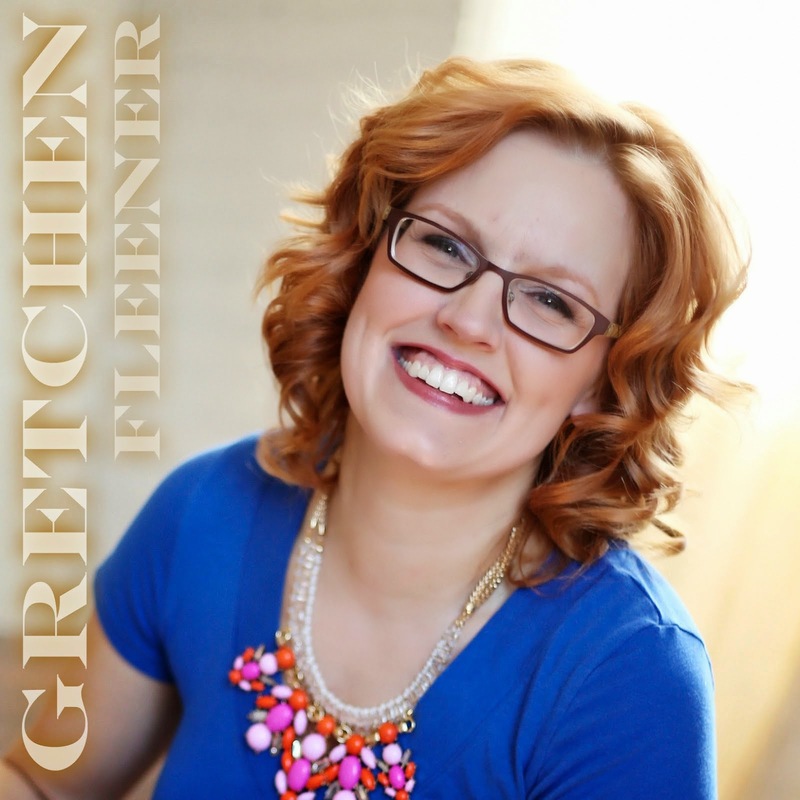 I've been there several times for business trips while working for Best Buy, and really fun design conferences while I was president of the MN chapter of IDSA. My last trip was a gift for my Mom on her 60th birthday...just her and I exploring the city for a weekend. 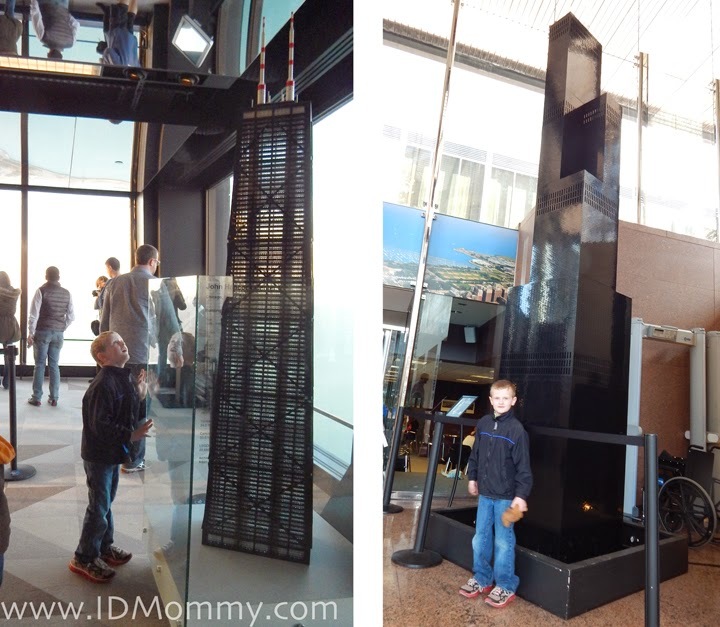 So, when the opportunity arose to take our boys to their first trip to Chicago earlier this spring, I was as excited as them! Also known as "the Bean," the Cloud Gate sculpture is really fun for everyone. Adults walk underneath like kids, looking up in awe and not paying attention to where they are going, lie down along the edge to get a picture, and kids just blend right in. It's a place where everyone acts a little silly, enthralled with their own reflections, and imaginations run wild! I thought the boys would enjoy a walk over the BP "Bridge to Nowhere," only we were pleasantly surprised to discover that it no longer leads to nowhere! At the other end now lies an incredible new park with one of the coolest playgrounds we've ever seen. 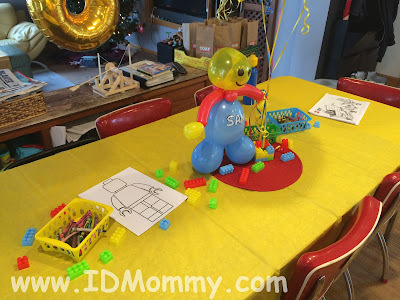 Being a Saturday morning it was pretty chaotic there, but wow did our boys have FUN!! Where else will your kids be allowed to draw on the walls and even the furniture?! Even with seriously over tired boys, we managed to wait the usual 45 minutes it takes to bake a genuine Chicago deep dish pizza without any meltdowns. 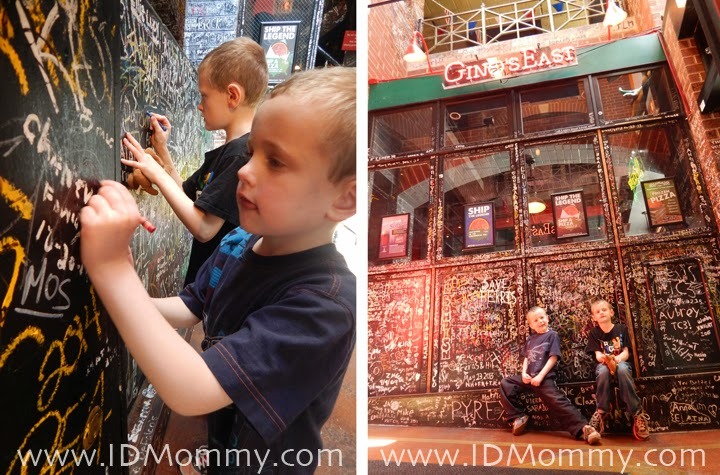 The boys got crayons almost immediately upon entry, colored their placemats, had some cheesy bread, explored the upper level, rode the elevator, left their marks on the walls, and waited for their pizza without asking for my phone to play games! The first morning we awoke to find our boys hiding between the curtains and the window quietly whispering "WOAH!" and "Oooooh, did you SEE that?!" After we rolled out of bed they told us they were watching a truck on fire, being put out by fire fighters! 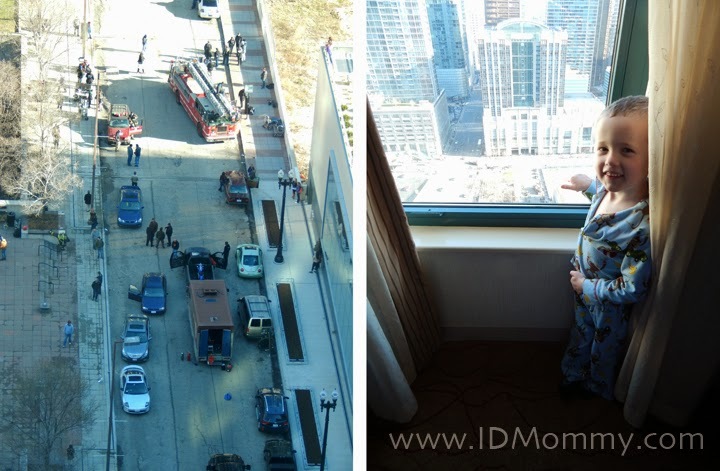 Later we found out that they were actually filming a scene for Chicago Fire right outside our hotel. Pretty cool for little fire truck fans!! The first thing the boys wanted to do when we woke up the first day was ride the Ferris wheel! Yeah, I know it's a total tourist trap, but still worth a stroll through. We must have gotten some sort of early bird special by accident because our $7/person entry to the Ferris Wheel ended up being a pass worth 2 rides each. So, the boys got to go on a couple other rides as well! What little boy doesn't love being hurled through the air on swings?! It's definitely a fun and unique way to enjoy an amazing open air view of the city from up high. Besides just enjoying the amazing views from above, we had fun being spies and zooming in on stuff the boys wanted to investigate with my camera. On the left is a photo of the beach, viewed from the Hancock Tower, where we noticed that someone had written a marriage proposal in the sand! The image in the center is of some prisoners playing basketball on the rooftop exercise yard of the Metropolitan Correctional Center. The far right the boys got their thrills stepping out on the sky deck! Wherever you walk there is bound to be some ordinary Chicago occurrence that will fascinate little boys. 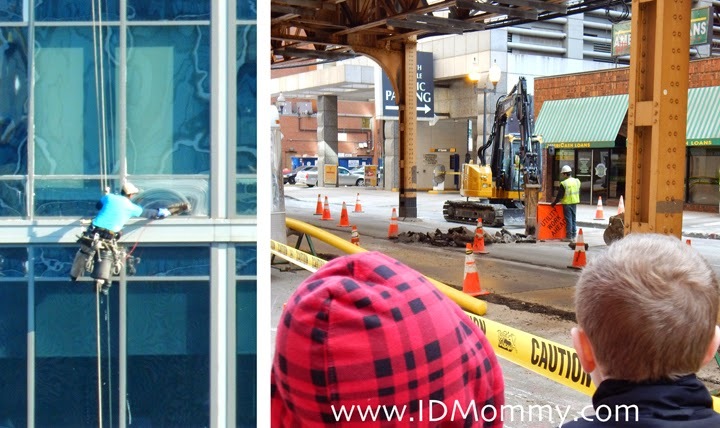 Here we had fun watching a window washer at work, as well as a jackhammer tearing up the street. Our boys never grow tired of heavy equipment, noise, dirt and danger! If you can catch the lift bridges opening up, it's sure to be a hit. The only one we had time to hit in our short trip this time was the Art Institute of Chicago. Sam was really excited to see so many familiar paintings and favorite artists! He happens to have an AMAZING art teacher and told me all sorts of fun facts about particular paintings and artists that even I never learned in my years of college art history classes. Their armor exhibit was a hit with the boys too! 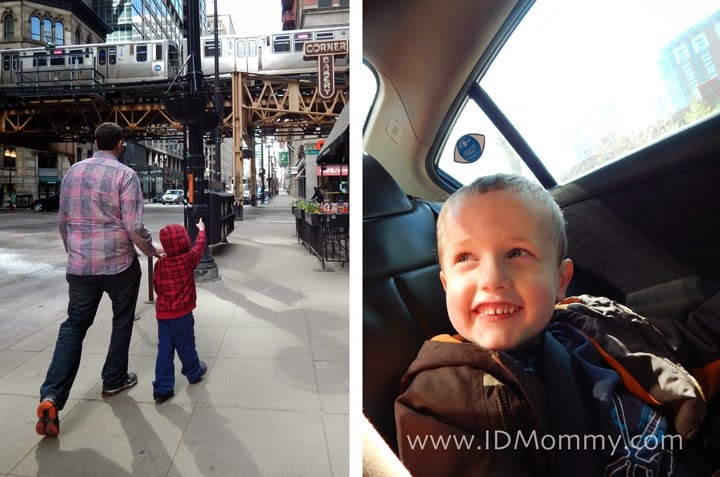 I grabbed a ride via Uber with the boys to the Lincoln Park Zoo while Daddy was working, and it was great! Unfortunately we got there shortly before closing, so we didn't have a ton of time. The great thing about this zoo though is that it is FREE, so you don't have to feel like you need to cram every square foot in on one visit to get your money's worth. 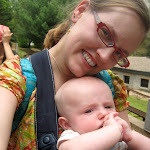 The zoo was really beautiful and manageable for us on foot. After the hour or so that we had there, they were tired and ready for dinner so we tried one last, great Chicago pizza place: Giordano's! 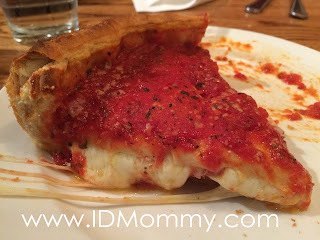 Giordano's was my favorite pizza...but Gino's was my favorite crust. Both amazing! All in all it was a GREAT trip and the boys can't wait to go back! To top it off, we even managed to weave in some requirements for Sam to earn a travel related Cub Scout "belt loop!"